The Army continues to send its men and cannons to Madhya Pradesh and Rajasthan in a bid to keep its men ready for battle after the Defence Ministry flagging the issue of dearth of field firing ranges in Jammu and Kashmir due to non-renewal of lease by the state government.“The cumbersome process of sending troops and artillery to Bobina and Mahajan field firing ranges in Madhya Pradesh and Rajasthan, respectively, is still on,” said Army sources.The sources said the practice of moving troops and arms and ammunition, including cannons, to field firing ranges in Madhya Pradesh and Rajasthan has not only put an avoidable burden on the state exchequer, but hampered operational preparedness and counter-insurgency operations in Jammu and Kashmir as well.“After the state government refused to renew lease of field firing ranges, the Army has been sending troops and canons via train to Bobina and Mahajan ranges since January 2015,” they added.Under such circumstances, the Army had no option but to send men and machinery outside the state for perfecting artillery fire and other warfare tactics, the sources said.Jammu and Kashmir shares its borders with China and Pakistan, the two countries which have fought wars with India. “Firing ranges are an indispensable requirement of the Army to keep its men ready. The Northern Command has been time and again flagging the issue before the Defence Ministry,” said a defence source.“Even the Defence Ministry has said restrictions imposed by successive state governments vis-à-vis firing ranges have compounded problems of the Army. There are no such restrictions for our adversary on the other side of the western border,” the source added.On February 12, the Northern Command chief, Lt Gen DS Hooda, said the Garhi field firing range was notified to the Army and he was hopeful of getting Kalith and Hirangar ranges soon. He had hoped for forward movement on ranges in Ladakh and wished that things moved faster in Kashmir as well.A rider by the Union Ministry of Environment and Forests on May 28 last year of a 10-km safety zone around field firing ranges had made things difficult for the Army in re-notification of 10 firing ranges.A fleet of over 25 multi-axle vehicles of the Army moved from Punjab into the Jammu region on Friday night to relocate tanks in the border state. Power generation in the second reactor of the Kudankulam Nuclear Power Project is likely to commence before the first week of June as loading of enriched uranium fuel in the reactor began on Wednesday night. Sources in the KKNPP told The Hindu that robotic loading of 163 enriched uranium fuel assemblies, each measuring about 4.57 meters and weighing about 705 Kg, began on Wednesday and the exercise was likely to be completed in 10 days. “If it is completed as planned, the reactor will be ready for criticality, which will be taken up after getting mandatory nod from the Atomic Energy Regulatory Board,” the sources said. After preparing the second 1,000-MWE VVER reactor, being built with Russian assistance, for the ‘hot run’, the KKNPP started the exercise last year. During this test, the second reactor, its associated closed primary coolant pipelines, secondary coolant circuits, and the concrete reactor containment building demonstrated the strength and integrity prior to reactor start-up. The reactor pressure vessel, the main coolant pipelines and every part of the reactor were tested during the ‘hot run’ by sophisticated robotic systems to ascertain whether these could withstand extreme factors as per the design specifications. After an analysis by the Russian and KKNPP experts and the representatives of AERB at the KKNPP complex, the data obtained during the ‘hot run’ and subsequent inspections were forwarded to the AERB for its final nod for removing the dummy fuel assemblies and loading the 163 uranium fuel assemblies. Since the experts were satisfied with the hot run data, the dummy fuel assemblies were removed and the AERB gave permission for actual fuel loading. Officials added that this was the first nuclear power plant in the world where the post-Fukushima safety enhancement requirements had been implemented and were being operated successfully. Russia is building the KKNPP under a 1988 intergovernmental agreement. Unit 1 of KKNPP, India’s most powerful nuclear reactor till date, was commissioned in autumn 2013 and was restarted after a scheduled preventive maintenance on June 23, 2015. India and Russia had agreed to set up six VVER-1000 type reactors of 1000MW each at Kudunkulam to be supplied by Rosatom State Corporation of Russia. Russians have emphasised that theirs is the only active civil nuclear cooperation as nuclear cooperation with the U.S. and France has been repeatedly delayed. SRINAGAR: Kashmiri separatists on Friday mounted an attack on Mehbooba Mufti-led coalition government saying any plans to establish “separate townships for Kashmiri Pandits, colony for ex-servicemen and providing land to non-state subjects” won’t be allowed. Jammu and Kashmir Liberation Front (JKLF) chairman Yasin Malik said that his party would fight any attempt to establish separate colonies for Pandits and ex-servicemen of the state. He said that Pandits have a right to live in the Kashmir Valley like others. “They are like our brothers and sisters. But we won’t allow the government to settle them behind the walls of hatred on the pattern of Israel,” Malik said while addressing a press conference. “There are already about 10,000 Pandits living with their Muslim brethren in Kashmir. But composite colonies will be opposed tooth and nail,” he said. On Thursday, the government confirmed its plans to set-up townships for the Pandits who migrated from the Valley in early 1990s. Government spokesperson and education minister Naeem Akhtar said that the government was keen to get Kashmiri Pandits back with “respect and dignity”. Malik was also aghast over the government’s new industrial policy and opposed establishment of any Sainik Colony in the state. He said that his party would oppose any Sainik colony whether that was for army men from the state or outside. “Even if we have to give our blood to stop these policies we will not hesitate to do so,” he said. New industrial policy of the state allows non-state subjects to get land on lease for establishing industries in the state. Malik said that new industrial policy was similar to establishing East India Company which later subjugated the whole country. Call up mob no 8087587659 for further info about the below job. We are looking for a Army Background Officer for our Bangladesh Power Projects for an appointment of Chief Security Officer. Will be based at Dhaka. Expected salary of approx 18 Lacs plus overseas allowances of approx 659 USD , free food and accommodation. This is for L&T Power Projects. Any references please get in touch. MAJOR TERM OF REFERENCE SHOULD BE ABLE TO SPEAK AND READ BENGALI. Chinese media on Thursday reported that the country’s military had sent teams of dedicated corruption inspectors to its units for the first time. This reportedly is a part of Chinese President Xi Jinping’s war on graft that targets high-ranking officials in the military, government, ​and industry. Meanwhile, China has started broad military reforms including modernisation of the command structure. DEHRADUN: President Pranab Mukherjee expressed concern on Monday over the forest fires in Uttarakhand that gutted vast Himalayan jungles as police arrested four villagers for allegedly starting blazes. BIRBAL SHARMA/HTSmoke billows from a forest fire in Kamru valley, 50km from Mandi, in Himachal Pradesh on Monday. CHAMBA KANGRA HAMIRPUR MANDI UNA BILASPUR SOLAN HIMACHAL PRADESH LAHAUL AND SPITI KULLU SIRMAUR KINNAUR SHIMLAMukherjee’s letter triggered swift action from governor KK Paul who first briefed the President, then Prime Minister Narendra Modi and finally environment minister Prakash Javadekar on the steps taken to douse around 100 fires across 13 districts blazing for over a week. The hill state is under President’s Rule at present. Uttarakhand additional chief secretary S Ramaswami said cases were registered against locals under the Indian Forest Act and the Indian Penal Code for burning forests as firefighting personnel struggled to control the blazes ravaging wildlife and vegetation in the hill state.In the state’s Chamoli district, a 25-year-old police constable was killed while dousing a forest when a rock fell on him. Police were also asked to investigate the possibility of the timber mafia setting forests deliberately on fire. “We are investigating all possible reasons, including the timber mafia’s involvement,” a police officer said. The blazes have razed over 2,900 hectares of lush Himalayan forestland in the past three months and killed at least four people, besides inflicting injuries on countless fire-fighting personnel. Vast tracts of the badly hit Garhwal region are engulfed in thick smoke. Uttarakhand HC also questioned the state forest department on preparations for controlling the calamity. Under section 30 of the forest act, persons found guilty of burning forests can be sentenced 7 years imprisonment or penalty of over ‘1 lakh. “Villagers are culprits, cases have been lodged against them,” BP Gupta, chief conservator of forest (CCF) and nodal officer, told HT. More than 6,100 personnel and three IAF choppers have been deployed in Uttarakhand to extinguish hundreds of forest fires. But many local personnel have complained they were pressed into service without adequate gear, resulting in mounting injuries. “The department is giving us away as fire offering. We don’t have fire fighting uniforms that could save us from blaze,” said Ramesh Kothiyal, forester Gohri range. Summer forest fires, sometimes deliberate, are not uncommon as local residents start blazes to have new vegetation after the rains. But villagers have may started the fires early this year — weeks before the mid-May predicted rainfall — because of a forest fodder shortage triggered by drought conditions in 11 districts, including Pauri and Pithoragarh that are the worsthit regions. State disaster management department said the situation will be brought under control soon as firefighting is taking place on a war footing. Officials said an IAF MI17 helicopter carrying 5,000 litres of water made 25 sorties on Sunday and Monday to douse fires in Almora and Srinagar areas. The fire also spread to J&K and Himachal Pradesh, where summer blazes in grasslands and forests caused 378 incidents, mainly in the low hills, and destroyed flora and fauna in over 3,000 hectares. “As per the latest information, fire has been contained. Situation is under control now,” minister of state for home Kiren Rijiju told reporters in Delhi. The first of the six indigenous Scorpene-class submarines set out for sea trials today. Named Kalvari—sea tiger shark—the 66-m-long vessel is set to be inducted into the Navy in October-November this year.The submarines are being built by Mumbai-based Mazagon Docks Limited (MDL) in collaboration with French company DCNS. The remaining five vessels are set to be inducted by 2020.The submarine sailed out around 10 am today using its own propulsion for the first sea trial off the Mumbai coast. It completed a number of preliminary tests on propulsion system, auxiliary equipment and systems, navigation aids, communication equipment and steering gear. Various standard operating procedures were also validated for it. 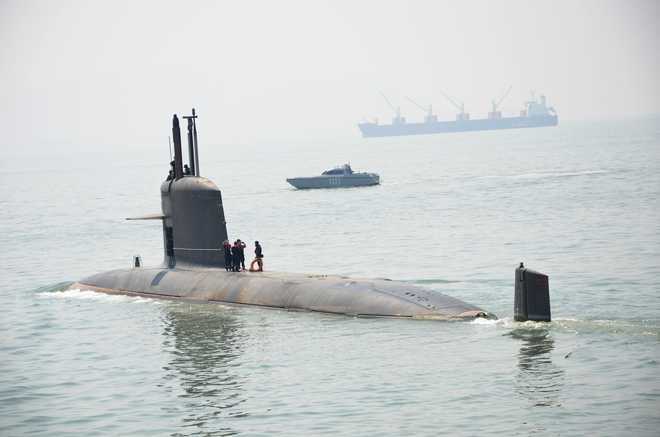 The submarine then returned to harbour in the evening, the India Navy said tonight.The Scorpene is equipped with weapons launching tubes (WLT) and can carry weapons on board that can be easily reloaded at sea through special handling and loading equipment. The array of weapons and complex sensors fitted on board the Scorpene are managed by an advanced combat management system, which integrates various diverse systems fitted onboard.However, despite today’s good news, the submarine’s plan to purchase heavyweight torpedoes for the vessel remains stuck due to the VVIP chopper scam. Over the past 15 years, India’s submarine arm is the slowest growing in the otherwise fast-growing war machinery. As debate rages over the death of five protesters in the Kashmiri town of Handwara, Lt Gen (retd) Syed Ata Hasnain feels that the army needs to ease up on using its power arbitrarily against citizens. “The army need not come in contact with mobs in Kashmir. We need to use 80 per cent soft power and 20 per cent hard. Instead, we are doing the reverse,” Hasnain said, while speaking on ‘National Security and the Threat of Radicalisation — A perspective’ at Abasaheb Garware College on Sunday. The lecture was organised by Maharashtra Education Society and Akhil Bharatiya Poorva Sainik Seva Parishad, Pune. Hasnain was handpicked as general officer commanding (corps commander) at the Srinagar- headquartered 15 Corps when Kashmir was rocked by the turbulent stone-throwing agitation in 2010. All military operations in the Valley are controlled by them and they are popularly known as the Chinar Corps. His approach had weakened the militants and created an atmosphere of hope in the Valley which saw a major increase in tourist traffic afterwards. “During the beginning of militancy in 1989-90, it was necessary to use more hard power. But, things have changed now. The number of militants has come down to 250 from over 5,000 during the early 1990s. My experience shows that the army generates only 10 per cent intelligence, while the rest comes from the special operations group of the J&K police. The army should remain in the rural areas and the police and Central Reserve Police Force should deal with mobs,” the general said. “Soft power involves the army penetrating the villages and helping people in various tasks to create a bridge with them, while ensuring that this approach is not misused by militants and hardliners. When I met the people of J&K, they would hand over small chits mentioning their problems. I found that there had been no effort to connect with the masses in the last 25 years. There is a need to create hope among Kashmiris and change their perception about India,” he further explained. He also believes that Pakistan’s Inter-Services Intelligence is trying to create problems using certain fault lines. “We need Indian nationalism and not subnationalism based on regions within the country. Anti-national elements use social media aggressively to create rifts which we should guard against,” he concluded. A team of the National Investigative Agency (NIA) today arrived in Landaura of Haridwar district in connection with four suspected terrorists arrested in January this year. The arrested youths had links with terror groups and were tasked with carrying out bomb blast during Ardh Kumbh.NIA sleuths went to the house of Azimussan, one of the arrested suspects, and questioned his family members. They also conducted a search operation near the house.The sleuths then headed to the Landaura Railway station where another arrested youth Osama had built a temporary room, near a tubewell, above which they used to store ammunition.An NIA expert also drew a sketch map of the railway station, tubewell, Osama’s room and the nearby area.When mediapersons tried to click photographs of the NIA team, an NIA official on account of secrecy and sensitivity of the case told them not to do so and deleted photos taken by a photographer.SP, Rural, Parmendra Dobhal said the NIA works on its own and hence the district police had nothing to do with the case until the central agency approaches them.Notably, four persons were arrested from Roorkee on January 20, when Adh Kumbh had just begun, for allegedly providing information to terrorists about the Ardh Kumbh security, traffic and other aspects.The initial probe had revealed that the arrested persons were in touch with terrorists through the internet, social media and mobile phone chatting. Laptops, mobile phones and other technical equipment were seized from their possession.All four had done a recce of Har-ki-Pauri, Haridwar railway station, bus station, important government offices, buildings, Mela Control Building near Har-ki-Pauri, important bridges and the public sector undertaking Bharat Heavy Electrical Limited building. They had also surveyed the Roorkee railway station, the Bengal Engineering Group military cantonment area and the Central Building Research Institute. A special Delhi police team in coordination with the Central intelligence agencies had arrested the suspects after getting substantial intelligence inputs of their links with terrorists. WHAT EVERY FOLD OF TURBAN REPRESENTS? It may be your right not to stand for the National Anthem or the Flag, but before you decide.. Let me introduce you to those who can't stand bcoz they defended that right..